Sicily's Mafia is rebuilding its networks in the US, according to an Italian parliamentary report. The report says Cosa Nostra has been sending people to the US to form alliances with families with which it had lost contact in the 1980s. It says that while the mob maintains a foothold in the lucrative drugs trade, it is now moving into new areas. Although Cosa Nostra has its roots in Italian organised crime, it has long been a separate organisation in the US. But this month in an operation codenamed Old Bridge, a reference to these long-standing links between Sicily and New York, the FBI revealed details of the new relationships being formed across the Atlantic. 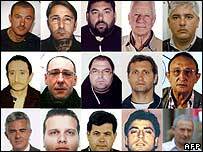 They rounded up more than 80 gangsters in New York including the acting bosses of the Gambino crime family - known to have direct links with Sicily. The Italian anti-mafia commission says Old Bridge was a remarkable success but it shows the Sicilian Cosa Nostra is "re-establishing its links with the American cousins". The commission says it has evidence Cosa Nostra is sending its top members to New York while allowing those expelled by the mob during the clan wars of the 1980s to return home to Sicily. Their report says that many US food distribution and construction firms are now controlled by the US Cosa Nostra, whose bosses are of Sicilian origin and have direct links. And while Cosa Nostra still maintains its control over the lucrative drugs trade and its traditional activities of extortion and racketeering, it is now diversifying into new industries like online gambling. Angela Napoli, a member of the anti-mafia commission, says the work to defeat Cosa Nostra falls on the Italian politicians - who must do more - and on the very brave witnesses who come forward to give evidence. The commission says not enough is being done to help them. Those under state protection say they feel abandoned. And consequently the number now prepared to come forward is falling.